Compared are the UK Version, released on tape by Braveworld (BBFC 18), and the German Version (Uncut), released on DVD by X-Rated (Unrated). Lester, a butcher, land owner and owner of an old farm (with all the stuff a butcher needs), has trouble with the authorities: He is supposed to agree to a deal, otherwise his property will end up in execution sales in 30 days. Lester and his retarded son Buddy don't want to let that happen and conspire: agreeing to the deal to lull the guys into a false sense of security and killing them afterwards. But some teenagers get also involved and it shan't be long till the police searches for some missing people. 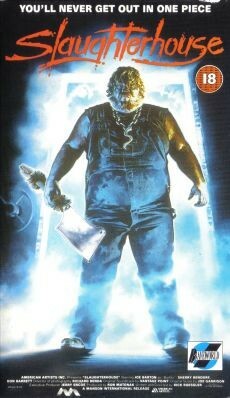 Basically, the film is a typical 80ies slasher. But it's one of the better ones because it doesn't consider itself serious plus it's got a lot of similarities to Tobe Hooper's Texas Chainsaw Massacre. Nevertheless Slaugherhouse sometimes pulls TCM's leg. The story is absolutely acceptable for this genre and so are the actors. Certainly, the teenager are nothing but casualties, but the actor who plays Lester Bacon is really terrific (especially at the ending where he does some very nasty stuff), so is his son Buddy. The atmosphere is great and the set is very well chosen, too. The kills are pretty hard, even though some stuff is offscreen. Slaugherhouse is actually a "Must See" for fans of Hooper's TCM and for fans of the good old 80ies horror flicks as well. The US releases and the German releases were always uncut, only the tape in UK was cut. Some cuts might be reasonable, but I absolutely can't understand why some shots of the main character Liz were cut out. Those scenes aren't very violent and not more graphic than the scenes in Hooper's TCM which was released uncut in UK. The remaining difference is based on the fact that an NTSC master was used for the X-Rated DVD. 00:00 Two more logos (Manson Internation & American Artists) on the UK Tape at the beginning. 39:06 When Deputy Dave pulls his arm out of the sling, a shot of his chopped off hand is missing in the UK Version, blood splatters. 39:42 A shot of Buddy, who positions in front of the surprised Dave and throws his chopped off hand (including the gun) on the ground, is missing. 43:50 A shot of Buddy raising Murdock and Murdock's moving legs is missing. 43:52 The ending of Buddy squashing Murdock's face is missing, blood flows down. Furthermore the beginning of the shot, that shows Murdock's moving legs again, is also missing. 51:12 Shot of Buddy slicing Sally's throat. 55:53 Buddy pushes Sanford into the meat grinder. In the UK Version a shot of the turning rolls, including pieces of meat, and a shot of the smiling Buddy are missing. 67:24 The ending of the shot, which shows Buddy hitting the boy with his hatchet, is missing. The boy lies twitching on the ground. 67:27 Dito (this time the beginning of the shot is missing). 71:08 Longer shot of Buddy touching Liz plus a shot of Lester and the disguised Buddy. 71:25 The crying and fighting Liz. 72:04 Again Liz who tries to fight Buddy plus a cut to Lester. He tells her that he was still able to skin a pig within 30 seconds without losing fat. 72:18 Again Liz, Lester and Buddy. 72:30 Lester mentions that Liz was absolutely suitable for a soup. He adds that carving the finger was more painful than slicing one's stomach. He grabs the hand and carves it with a knife, Liz screams. Buddy also says that he could skin her in 90 seconds and that gutting her didn't take more than 3 minutes. 72:43 Lester pushes Skip's body in front of Liz and tells her to watch, so that she knew what he was going to do with her. 72:44 Lester's next to Skip's body, he's checking the body out. 72:49 Lester recognizes a noise and turns away. 79:15 When the credits are over, the image of the Unrated Version remains black and the score can still be heard for approx. 8 seconds. Instead the image of the UK Version shows the title and some further credits for approx. 10 seconds while the score can be heard.